Permits and/or residency requirements may apply for access to a launch site depending on the jurisdiction of the site. Nonresidents can purchase a day use or season launch permit for county boat ramps, still many town parks have limited to resident-only parking. Permits generally apply to put-ins and not to landing sites. Paddlers are able to land at any trail access point. Off season, Labor Day to Memorial Day, paddlers do not need a permit and seasonal parking fees do no apply. Paddlers and SUP can launch from the ocean beaches on Long Beach. Trail access site: Long Beach Boat Ramp. 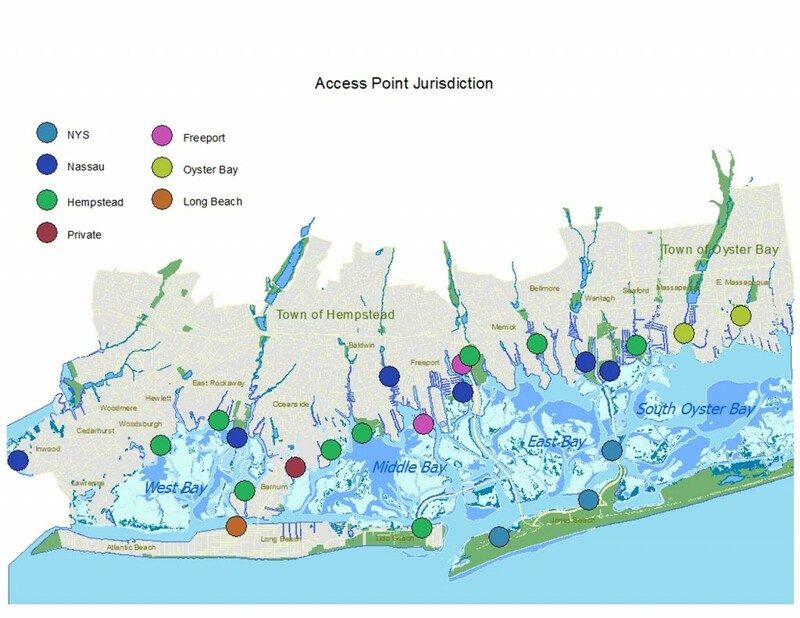 Boat Ramp Rules require all vessel operators launching from Nassau County boat ramps, whether using motorized of non-motorized watercraft, must obtain a county-parks-issued launch permit. No inflatables are permitted to launch at ramps. Access points include: Bay Park, Cow Meadow Park and Preserve, Inwood Boat Ramp, Milburn Creek Ramp, and Wantagh Park. Leisure Pass $25 identifies its holder as a Nassau County resident and is required for use of many county recreational facilities, beaches, marinas, and ramps. Seasonal Launch Ramp Permit: $50.00 residency permit fee, sticker issued to Nassau County residents only allowing use of ramp and parking. Permit stickers are placed on the vehicle bumper. Must have valid New York State registration and Leisure Pass to purchase the permit. One Day Launch Permit: $20.00 fee per day, permit to be displayed on car dashboard. Nonresident Parking fees: $10 on weekends, beginning Memorial Day through Labor Day. Access to Town of Hempstead parks and recreational facilities is free to residents year-round. Access points include: Baldwin Park, Harbor Isle Beach, Hewlette Point Park, West Marina Town Ramp, and Woodmere Dock. A resident permit is not required at Norman Levy Preserve. Town Boat Ramp: No permit required. Vehicles with trailers get priority launch access. No fee at ramp for hand-launched boats. Access points include: Alhambra Road and Burns Park. Boat Ramp: Resident fees seasonal trailer sticker is $65.00; daily use $15.00, Resident Senior Seasonal Sticker – No fee. Non-Resident Fee Seasonal trailer sticker $150.00; Day use $30.00. No permit required. Access 24/7 at Albany Avenue.